A tremendous thank you to Dr. Anne Farrer for an incredible talk about modern printmaking in China. She brought the prints to life through a fascinating explanation of techniques and influences, and beautiful imagery. 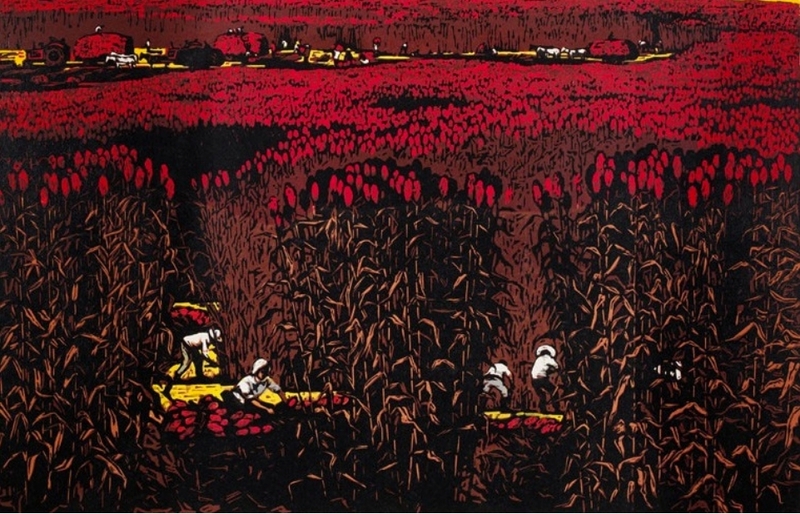 Xu Bing's reduction print, "Five Repetitions Series – Crop Fields, 1986", showing the deconstruction of the reduction print process, is a must see - at the Muban Educational Trust. Dr. Farrer is a Senior Research Fellow of the Muban Educational Trust and a Programme Director for the MA in East Asian Art at the Sotheby’s Institute of Art. She is a former Assistant Keeper of "Chinese Paintings, Prints, and the Chinese Central Asian Collections" at the British Museum where she has created major exhibitions. Her exhibitions and publications include Caves of the Thousand Buddhas: Chinese Art from the Silk Route; The Brush Dances and the Ink Sings; and Chinese Printmaking Today: Woodblock Printing in China 1980-2000. A detail showing the incredible texture and minute detail of a work by Hao Ping (b. 1952), Holy Field Series: Understanding. 1998. Reduction print, oil-based inks on paper. Muban Educational Trust. The point at which the audience gave a collective wow: Chao Mei 晁楣 (b. 1931), September in the North, 1963. Multiblock woodcut, oil-based inks on paper. Muban Educational Trust. Incredible work. 3rd Muban Educational Award Finalist. Ren Huihui 任慧慧 (b. 1985), Song of the West no. 5, 2016. Reduction print. Graduate of Xinjiang Shifan Daxue. Last but not least, this playful work by Chen Li 陳里 (b. 1971), Wind Playing with the Ocean Waves. 1999. Reduction print, oil-based inks on paper. Part of our exhibition.